Premium lot that backs up to acres and acres of wooded common area for this 4BR/2.5BA with 3200+ of finished square footage and a 1500+ sq ft basement! 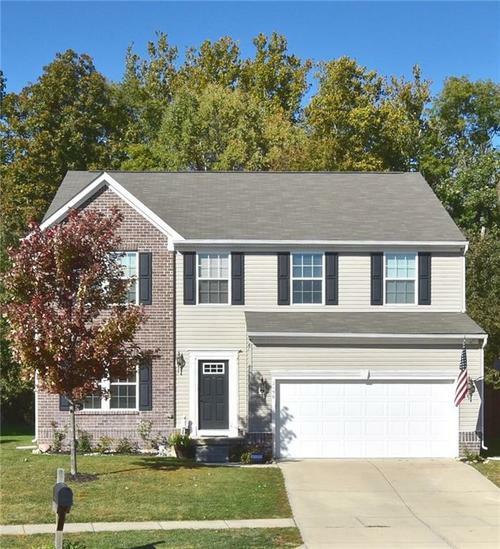 Open main level floor plan includes huge family room, separate office, walk-in-pantry, half bath, and dining room! Master BR suite offers sitting room, two walk-in-closets, separate tub & shower, and dual sinks! Full basement awaiting your finishing touches offers daylight windows and bathroom rough-ins. Subdivision is convenient to I-65 access and includes pool, walking trails, parks & playgrounds. Directions:Main St to CR 200 E, South on 200 E to Allen Rd, Allen Rd to Community Entrance at Classic Lane, Classic Lane to Welcome Way right on Welcome Way to Treehouse Pass, to home on left.